Through Split Brithes, Lisa found her way to the WOW Cafe, a hot-bed for experimental lesbian-centered work in the New York’s East Village, the city’s bohemian heart. At WOW’s tiny storefront theatre she found a like-minded tribe of theatre-makers devising their own work, writing their own plays, sometimes in a few months, sometimes in a few days, with sets and costumes made from found materials. It was here that she started doing her own solo work. And it was here that she, her girlfriend Peg Healy, and friends Maureen Angelos, Babs Davy, Dominique Dibbell, formed the Five Lesbian Brothers. 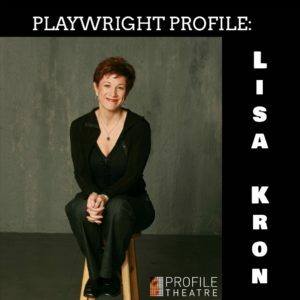 Throughout the ‘90s, both Lisa’s solo work and the plays created with the Brothers gained increasing prominence, and were produced throughout New York at PS 122, The Kitchen, Dixon Place, HERE Arts Center and eventually at large off-Broadway venues like New York Theatre Workshop and in 1997 The Public Theater, where 2.5 Minute Ride opened to rave reviews, winning OBIE, Drama-logue and GLAAD Awards. The Public Theater became an artistic home for Lisa, developing and producing her plays Well, which transferred to Broadway, earning Tony nominations for Lisa and co-star Jayne Houdyshell; In The Wake, Lisa’s most traditionally well-made play; and Fun Home, her musical written with Tony-winning composer Jeanine Tessori, which also transferred to Broadway, winning 5 of its 12 Tony nominations, including Best Musical of 2015. Throughout it all, what makes Lisa’s writing indelibly Lisa’s is her interest in the mix of theatrical forms — from the straight play to solo story-telling to ensemble-generated work, sometimes co-existing in the same piece — her commitment to politically-engaged work, and her conviction that laughter and tears, joy and sorrow, can inhabit the same moment. You’re in for a wildly funny and deeply moving ride.